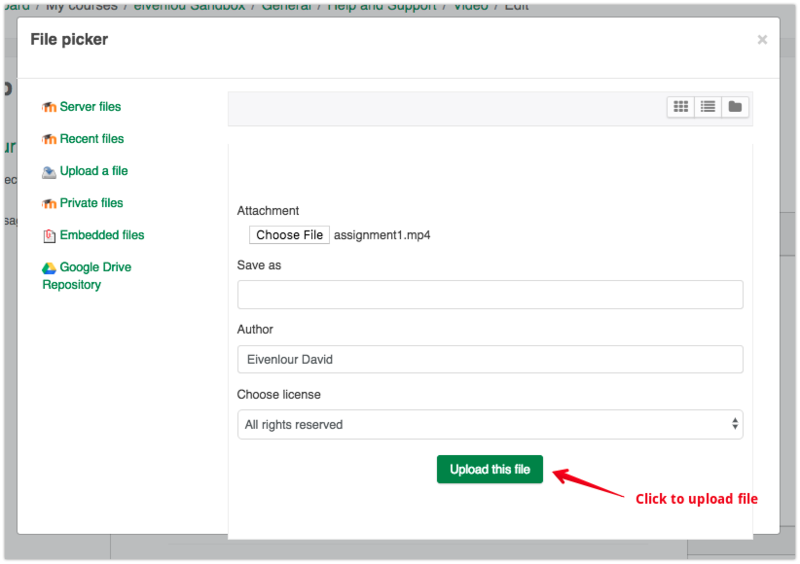 This article explains how to upload a video from your computer into an editable content area on eClass. 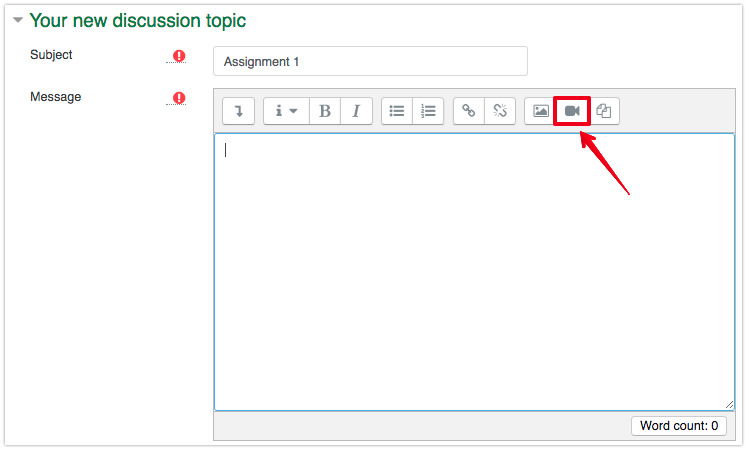 If you are a student, you would normally be doing this in a discussion forum, an online assignment submission (not an assignment requiring a file upload), or a collaborative page such as a wiki or glossary. If you are an instructor, you might be doing in this in any of the course construction areas of eClass: topic headers, pages, forums, activity/resource descriptions, etc. 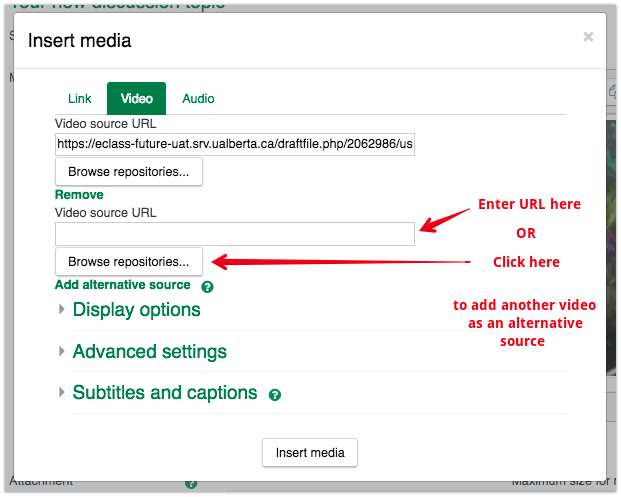 Note that it is not generally recommended to host video files directly within eClass - a better practice is to host the files on a server meant for video display and streaming and add it to eClass through the url or by embedding. 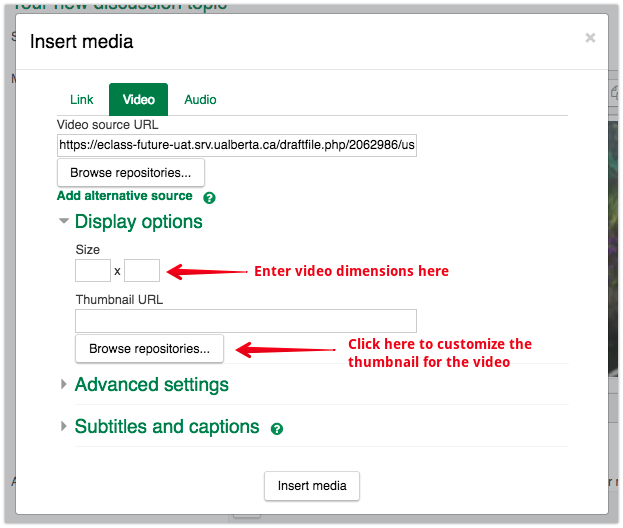 See the following article for instructions on that process: Embedding videos in eClass. 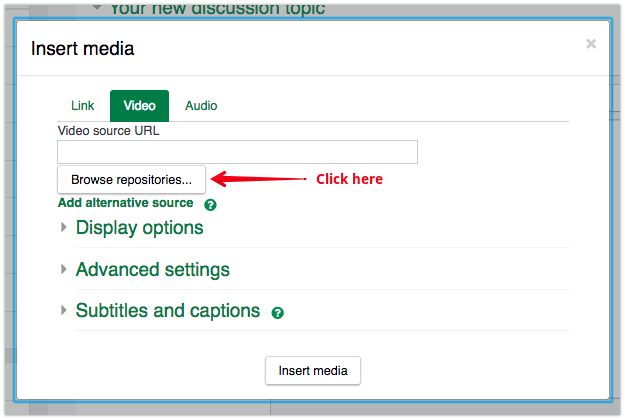 Enter the discussion forum, then click on Add a new discussion topic; or within an existing discussion topic click Reply. - 'Link' - Used if the user does not need to modify any settings for the media file to be uploaded. This is the default tab. 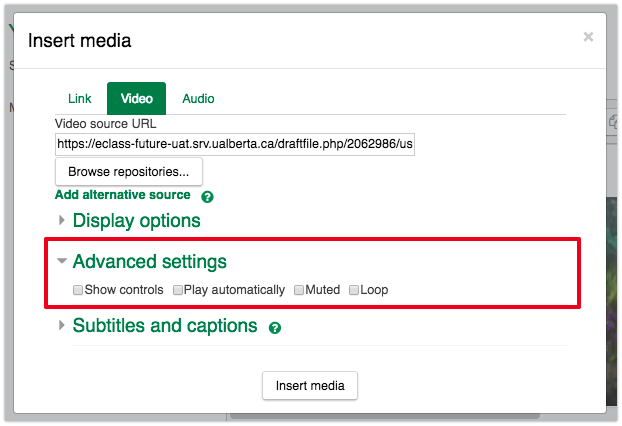 - 'Video' - Allows the user to modify settings for the video file to be uploaded. - 'Audio' - Allows the user to modify settings for the audio file to be uploaded. 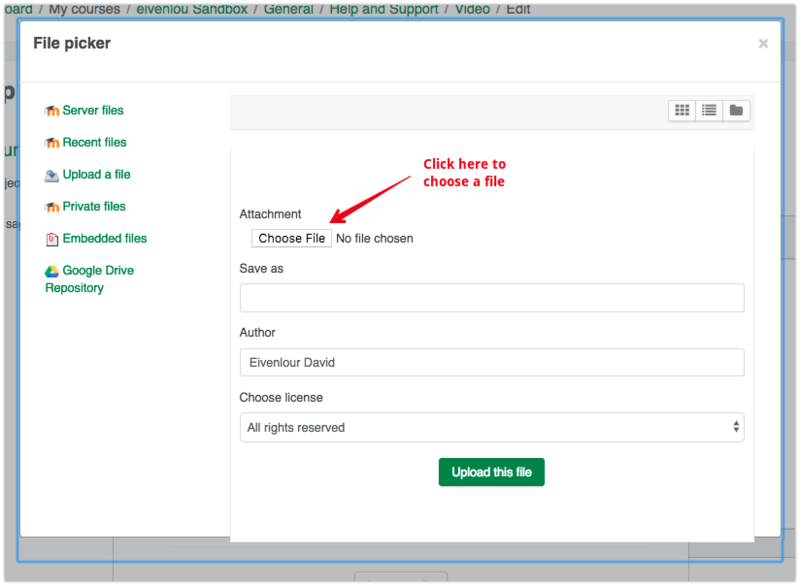 Navigate to the video file stored on your local computer and click Choose File. Click on Upload this file and you should see a new window open. 'Add alternative source' - This is recommended since desktop and mobile browsers vary in which file formats they support. 'Size' - Allows the user to customize the size of the video. 'Thumbnail URL' - Allows the user to add or upload a thumbnail. 'Shows controls' - Toggles whether or not the controls in the bottom of the video are shown. 'Play automatically' - Toggles whether or not the video plays automatically. 'Mute' - Toggles whether or not the video is on mute when played. 'Loop' - Toggles whether or not the video plays on a loop. 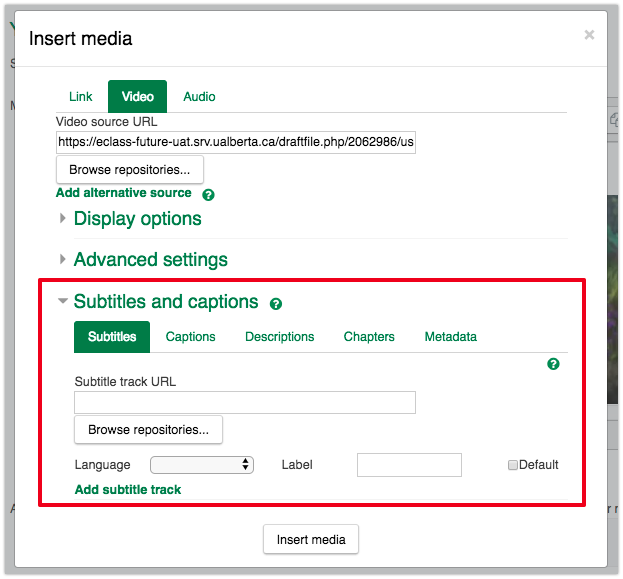 Subtitles, captions, chapters and descriptions can be added via a WebVTT (Web Video Text Tracks) format file. Track labels will be shown in the selection dropdown menu. For each type of track, any track set as default will be pre-selected at the start of the video. 'Subtitles' - May be used to provide a transcription or translation of the dialogue. 'Captions' - May be used to describe everything happening in the track, including non-verbal sounds such as a phone ringing. 'Descriptions' - Audio descriptions may be used to provide a narration which explains visual details not apparent from the audio alone. 'Chapters' - Chapter titles may be provided for use in navigating the media resource. 'Metadata' - Metadata tracks, for use from a script, may be used only if the play supports metadata. 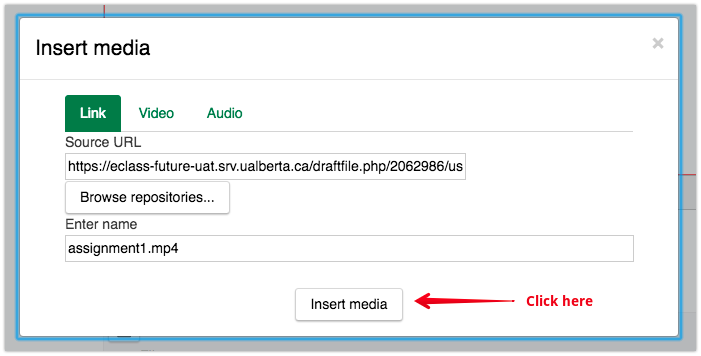 Select Insert Media to finalize your upload of the video file.